Many throughout history have believed in reincarnation in one form or another. What does the Bible say? After death, will we live again in some other form? There is something in the mind of man that believes, or wants to believe, that there is more to the story of life than our current experience. We are born; we breathe; our hearts pump blood through our bodies; we are conscious; we think; we live for a while—and then we die. We stop breathing; our hearts stop pumping; our thoughts perish. But then what? Is that all? The rather depressing conclusions of materialism and evolution are that we evolved from nothing and return to nothing. The life we experience is an accident, with no supreme purpose; and it ends with finality. For most people, it would seem, materialism’s answer is unsatisfactory. So, throughout human history, the majority of people have turned to some sort of religion for the answers. Some religions teach reincarnation—the belief that a person’s present life is merely one of a series of lives he or she has lived and will live and that the form of these lives can be different (and not always human) depending in part on the person’s thoughts and deeds (karma) in the present life. The teachings of the various sects of Jainism, Hinduism, Buddhism and other religious systems vary in detail, but include some form of reincarnation (also known as the transmigration of souls or metempsychosis). Even some who profess Christianity believe in reincarnation. According to these belief systems, one or more of a person’s previous and future lives may be spent as plants, animals, human beings or spirit beings—depending on the karma of our present and past lives. Some believe that this entire system is depicted in a great mandala—a circle enclosing a square that represents the universe. The ultimate purpose is to become good enough so you can be released from the cycle of life-death-reincarnation-suffering into some sort of state of freedom from fear, pain, ignorance and death. The Bible has much to say about life after death. It is very good news! And it is quite different from religions that feature reincarnation. Depending on the system, this final release can take eons of time, many lives, great desire to be released from the cycle and great suffering along the way. Some who teach reincarnation also insist there is no personal, individual “God” involved in any of this, but that “life” itself is the focus of the whole enterprise. Is Reincarnation in the Bible? The Bible has much to say about life after death. It is very good news! And it is quite different from religions that feature reincarnation. This good news centers on the will and purpose of one true God, who has determined through His Son, Jesus Christ, to create an eternal, spiritual family (Romans 8:29; Colossians 1:15-18). The Bible reveals that existence is not an endless cycle of life and death and reincarnation to another form of life. 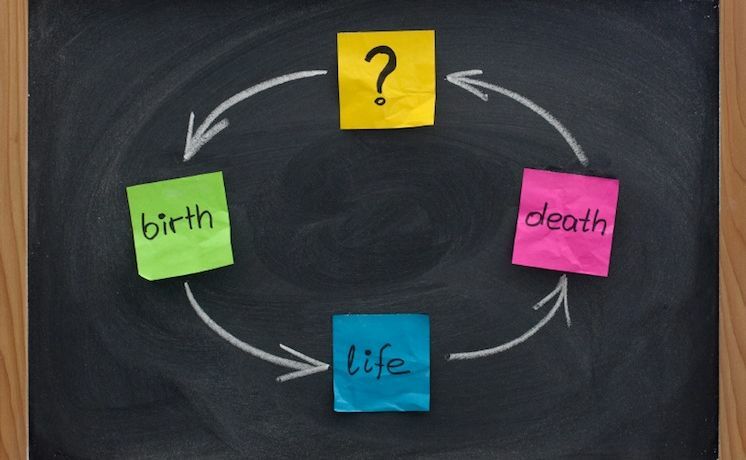 The Bible reveals one cycle: mortal human life, then death, then a resurrection to judgment. The first man, Adam, had not previously existed as a conscious being—not a plant, animal or spirit. Note what God told Adam following his sin: “In the sweat of your face you shall eat bread till you return to the ground, for out of it you were taken; for dust you are, and to dust you shall return” (Genesis 3:19). Scripture clearly states that “it is appointed for men to die once, but after this the judgment” (Hebrews 9:27). There is great purpose to this life! In Scripture God reveals His transcendent purpose for human life. Ultimately, we are to be children of God the Father and brothers and sisters of Jesus Christ, living in harmony and righteousness with God forever! The working out of this purpose begins with the physical, conscious existence of human beings in this life and ends with the spiritual likeness and image of the Creator. Consider what the Bible reveals about this wonderful truth. We are created in the “image” of God, meaning that, while we are physical, God has given us the capacity to fulfill His incredible purpose for us. “Then God said, ‘Let Us make man in Our image, according to Our likeness; let them have dominion over the fish of the sea, over the birds of the air, and over the cattle, over all the earth and over every creeping thing that creeps on the earth.’ So God created man in His own image; in the image of God He created him; male and female He created them” (Genesis 1:26-27). In this physical life we must accept God’s offer of His Holy Spirit, which makes possible spiritual growth so that we can be created in His spiritual image: “Do not lie to one another, since you have put off the old man with his deeds, and have put on the new man who is renewed in knowledge according to the image of Him who created him” (Colossians 3:9-10). “Therefore, if anyone is in Christ, he is a new creation; old things have passed away; behold, all things have become new” (2 Corinthians 5:17). Our purpose is to develop the spiritual characteristics of Jesus Christ so that “we all come to the unity of the faith and of the knowledge of the Son of God, to a perfect man, to the measure of the stature of the fullness of Christ” (Ephesians 4:13). “The sting of death is sin, and the strength of sin is the law. But thanks be to God, who gives us the victory through our Lord Jesus Christ” (1 Corinthians 15:53-57). If this brief summary of God’s purpose (not reincarnation, but resurrection) for all human beings sparks your interest, then please read more about it on this website. Think about what you are reading. Pray that God will help you understand it and believe it, for it is based on the one source of believable truth—the Holy Bible, the Word of God. For more information about what really happens after death, visit our Life After Death resource page. When Was the Last Time You Died?